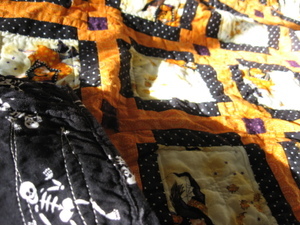 We got out our Halloween Stuff this week - including the Halloween quilt I made. The kids like it - wonkiness and all. Trust me, there is some serious uneven-ness going on here - but that's okay, it's fitting for Halloween, right? 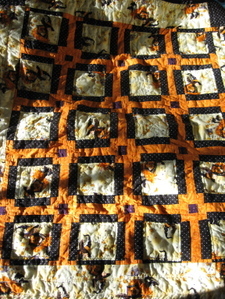 This was mostly-quilted with a walking-foot that I didn't realize was broken. Not ideal. The fabric is this witch stuff I picked up at Joann's a couple years ago. I liked the witches and the little bits of purple. Because purple is a magical color and completely appropriate for Halloween... and Christmas. The back and binding are black with skeletons. 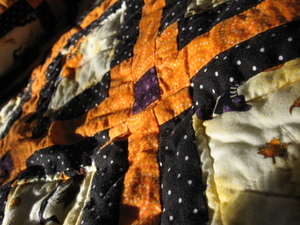 One thing I should have done was use a black bobbin for the quilting - but I didn't realize until it was too late. Oh well. I like how it kind of looks like witches flying outside of windows. The pattern (I used one!) is from the Quiltmaker's Gift book. I'm realizing now that the quilt looks much bigger than it is - it's quite small, actually. Barely lap size. But it's fun to have around the living room.